Converge Challenge is Scotland’s premier pan-university company creation and entrepreneurship competition for staff, students and recent graduates of Scottish universities, with a total prize fund of over £150,000. As Converge Challenge’s long-standing design partner and sponsor since 2013, Morton Ward has been working hard with the Converge team over the past few months to create a new look and feel for all campaign materials, making greater use of a light bulb as the ‘hero’ image for the competition. A classic and simple representation of ideas and eureka moments, we’ve added an imaginative new element to the light bulb concept for 2017, with fun accompanying sketches that turn the bulb in to a screwdriver, a teacher, a rocket ship, a superhero and other objects and characters relevant to different aspects of the competition. 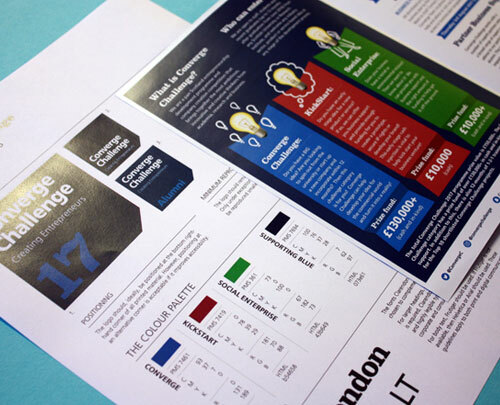 We’ve also added bright colours to some campaign materials, highlighting specific new areas of interest within the competition that Converge are keen to call attention and entries to. The result is a fresh, iconic new campaign that engages the audience, makes them think and encourages them to enter, while still retaining all the main recognisable elements of the Converge Challenge brand. Since starting to work with the Converge Challenge in 2013, we’ve strived to capture the essence of the competition each year and keep its communications different and exciting for new audiences. With a significant increase in entries every year since we began, we think we’ve been doing something right! We’re looking forward to continuing to work closely with the Converge team over the course of the year on on-going communications, awards ceremony materials and as design mentors to applicants and winners.